Below you will find UPSEE 2019 Result. Soon after the completion of the entrance exam, the official authority will announce the result for the same. The result will be published in the online mode and the students can easily check the same here soon after its release. Usually, the result will be announced in the terms of marks obtained by the candidates in the entrance exam. It is expected that the result along with the answer keys shall be announced in the month of May 2019. The exact date will be intimated soon after any official announcement. • The result will be available in the online mode and can be checked here soon after its official publication. • It will be prepared with the utmost care and, therefore, the declared result will be the final one and shall be binding. • In order to check the result, the students can use the direct link which will be mentioned here soon. This link takes the candidate to the result official page. • On furnishing these details, the aspirants can check their result on the screen. • The students can also save the result for the sake of security. Also, the result should be kept safe for the future reference. • Based on the student’s scores, the official authority will issue the merit list for the students. • This merit list will be prepared as per the UPSEE 2019 Result . • Merit position, scorecard with total marks and scores obtained in each subject shall be available soon after the result publication. • The students can check and download the merit list soon after its official declaration. In the case, if the two or more candidates secure identical marks in the exam then their tie can be eradicated by applying the tie – breaking procedure one after another. • First of all, the students need to consider the number of incorrect answers. The students with the least number of the wrong answers will be placed at the higher merit. • If still the tie persists then the higher marks in the mathematics will be considered. • Next, the tie can be eradicated by considering the marks in the physics section. • After this, the higher marks in the chemistry section will be preferred. • Finally, the tie can be resolved by preferring the age. The student with the higher age will be preferred over another. 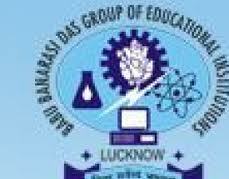 Babu Banarasi Das National Institute of Technology & Management, Lucknow is one of the self- financing engineering colleges in Lucknow that was established in year 1998 by Babu Banarasi Das Educational Society. The IET was established by the Government of U.